Papa is giving you grace to bloom in the worst of times. I felt like our Precious Holy Spirit wanted you to know today that He knows how hard it has been. He knows every tear that you’ve cried and every time your heart cried out in agony in response to the injustice, the senselessness, the pain. But I also feel like He wants you to know that He has seen your efforts to walk before Him in white. He has seen your tears as you have clung to Him. Even though it hurts, you’re still clinging. trusting that our Papa God is a good, good Father who will always take care of us, no matter how hard things seem during these worst of times. Sometimes that last thing is the hardest. None of these things are from the Lord. You can always tell when something is from Him or not, because God’s work will display His nature. He is just, so all His works exhibit justice. He is truth, so all His works exhibit truth. He is One, so all His works exhibit unity. He is love, so all His works produce love–never fear. And when things happen in your life that are so very obviously not from Papa, it’s hard to understand why. Partner update: I am earnestly praying for 1,000 people who will partner with me financially in the amount of $8 per month, so that I may pay the expenses of this blog, continue my work as a domestic missionary in my hometown and at my local church, and dedicate myself full-time to reaching people for Jesus. If God is stirring your heart to help with this work, please go here to read the details about my partnership program and what’s in it for you if you partner with me. Thank you SO MUCH in advance. I need you; I cannot do this Gospel work without you. And if you’re already one of my amazing partners, thank you doubly! You are continually on my heart and I lift you up to our Abba Father daily. I love you so much, and I am so thankful for you. Our Father is GOOD. Everything He does is good, and everything about Him is good. He is morally perfect. And that means that if He allows us to go through anything, it’s only because He is going to redeem it and give us something so much better. If you’re going through one of the hardest, worst times of your life, I believe Papa will help you see it this way too. Honestly, trusting in the absolute, moral perfection and redemptive goodness of my Father has been the only thing that has seen me through lately. It’s been hard to hang onto this revelation some days. Some days, I’ve had to listen to my favorite song–Good, Good Father by Housefires–over and over just to soak in God’s love so that I wouldn’t be afraid. But His grace has been sufficient, and He has helped. He has upheld me and sustained me through the darkest of nights. You might not have noticed it, but He has already been giving you grace to bloom in these worst of times. And because you have chosen to position yourself at His feet, forcing your soul to wait on Him alone, He is giving you more and more grace. You have humbled yourself, and Papa resists the proud–but He gives grace to the humble. So He’s giving you grace to bloom in the worst of times. You’re going to see Him reveal Himself to you as your Glory and the Lifter of your head. He’s going to restore you better than you ever were before. You’re going to see Him lift your head up above your enemies all around you (Psalm 27:6). He’s going to reward your obedience. He’s going to deliver you and honor you (Psalm 91:15). Things may not turn out exactly like you imagined; it’s most likely that they won’t. But if you will stay positioned for favor–clinging to the feet of Jesus, careful to stay humble and walk before Him in white–they will turn out better than you imagined. Better than you dreamed. It may be hard just a little while longer–but beloved, you can make it just a little longer! His grace is sufficient for you! Help is on the way. Papa is pouring out grace to bloom in the worst of times. And we know that all things work together for good to those who love God, to those who are the called according to His purpose” (Romans 8:28). Does this word speak to your heart today? Are you also seeing God’s grace to bloom, even in the worst of times? If so, please leave a comment below. I’d love to hear from you! I definitely need the extra grace. I have things going on that I know are not from God. I know He knows the answers to give people because I don’t have them. I want to walk in white. I even use bridal pictures in my blog. Thank You for Word ! You have made my day! And yes, God is my only source of help, I can’t make it without Him. The turmoil in my life. Thank You Lord for this Word! I Love You and need You!!! I can’t wait for more Grace!!! I recieve it! Thank you for reading, Trish. Papa has you inside the palm of His hand. You are part of Him in Christ. Never forget that. Papa, comfort and help my sister today, in Jesus’ name! AMEN! The God of WOW. I love that. I haven’t heard it before but I am definitely going to use that!!! 🙂 🙂 🙂 Thanks for sharing! Amen and amen! Thanks Jamie, your words of encouragement spoke to me today. God is good. Blessings to you. Thanks sis Jamie! I receive this as a message from the Lord! I was washing dishes and the holy spirit lead me to my e-mail and Viola! Sis im fighting the good fight of faith! I had to ask myself have you been in my mailbox reading my mail bc everything in your post is my situation! I know its the gift of knowledge and wisdom though but thanks sis for the spiritual breakfast! Just know u are hearing from God and be steadfast and unmoveable! Not working right now but do want to be a blessing to God vision through you soon. Much love signed in tears!!!!!!!!!!!!!!! Brandon, I prayed for you as soon as I got your comment. I couldn’t answer because I was out in the woods and had little-to-no internet! But brother, our Papa loves you and wants to give you rest today. I encourage you to focus on Him and actually imagine yourself laying your burdens down at the feet of Jesus. He said if you will come to Him, He will give you rest. May He lead you beside still waters and renew and restore and refresh your soul today. In Jesus’ name. Thank you Jamie. Been going through the VALLEY of the shadow of Death. Have moments when I don’t think I will make it. Then I have moments when I know, “of course I will, because I HAVE JESUS. How can I lose?”. But I keep falling. And failing and struggling with certain things that I know Jesus overcame on that cross. I’ve been praying for resurrection power. Praying for the king of glory to come into the gates of my soul, so he could permeate every inch of it. I know that He is stronger than ANYTHING that I am going through. Thanks for posting that. And be encouraged–you already have resurrection power because you have the Holy Spirit living inside you. Your job is to become obsessed with Jesus. His job is to change your heart. He will keep you and mold you day in and day out. Love to hear if the link above resonates with you at all. I will pray for you. Definitely what I needed to hear today at a time when we’re feeling very abandoned . Romans 8:28 happened to be my verse of the day too. Holding onto His promises even when I don’t feel like it. Trusting deliverance has to come soon. Father God, in Jesus’ name, I ask that You would ride into my sister Jennifer’s situation in a visible and obvious way. I ask You to tear things up in a good way to help them. Show them the answers to their prayers. Encourage my sister. Comfort her. Lift her up, and show Yourself to her as her Glory and the Lifter of her head–the Restorer of her place of authority. I ask it in Jesus’ name and I thank You for answering immediately. Amen! JAMIE THANK YOU SO MUCH FOR YOUR WORD YOU GIVE US. YOUR WORDS ARE SO TIMELY AND YOU REALLY ARE A MESSENGER OF GOD. THE RIGHT WORD ALWAYS COME WHEN WE NEED IT. I ALWAYS PRAY FOR YOU FOR EQUIPING US. THE WAY YOU EQUIP US WE DONT EVEN GET EQUIPED IN CHURCH LIKE THIS. I AM GROWING BECAUSE OF WHAT I LEARN FROM YOU THANK YOU. YOU DONT KNOW HOW MUCH YOUR WORDS MEAN. FATHER WILL REWARD YOU FOR GROWING US. Fiona, thank you so much. I am sorry I couldn’t respond sooner – I’ve been in the woods in the middle of nowhere for over a week and just got back! I thank you for sharing this, though. I pray continually for my readers, that Precious Holy Spirit would use my blog to touch and equip and encourage His people. It thrills me to the bottom of my soul to hear that He is. We must all grow and become strong so we can know Him better and fulfill His purpose for our lives! I pray our Papa would continue to bless and touch you today, in Jesus’ name. Thank you Jamie! It is very encouraging. 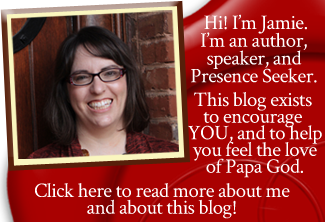 And it’s all Jesus… and I’m so glad Papa is using my blog to encourage you! I just sent you $16.oo through PayPal. I am pledging this same amount monthly. I am sponsoring someone who wants to give, but can’t at this time. Thank you greatly, and thank God for His Ministry through you. Thank you, brother. We are blessed by your support! Thank you for such a wonderful message be blessed. I am going through a season if hurt, pain, sadness, betrayal, loneliness – marriage separation, mother passing, an actual storm where my family lives and through the tears and the hurt I stand. He has blessed me continuously in ways that surpasses all understanding. I’m calm around my husband when an outburst would be justifiable, but not righteous. I have forgiven, let go, and pushed through tears to enjoy our 6 year old twins. Through this hurt – which they have no clue about – I have established night time prayers and children’s Bible readings. They love praise music, their favorites Lincoln Brewster’s “There is Power (in the name of Jesus)” and Jordan Feliz’s “The River” and Chris Tomlin’s “How great is our God.” They love it and ask to listen to our local Christian radio station at home. Grace. Grace us when you are broken and in tears feeling alone and you child out of nowhere starts singing “There is power in tje name of Jesus.” Grace is their love for the Holy Family and wanting to sleep holding onto a picture of the Holy Family – reminding me that family is important. Grace is sleeping, eating, praying and remembering the stories even though you can’t recall the verse (thank you Google). Grace is knowing Abba has etched His words in your heart and feeling His transformative power in your life. No, my marriage not restored. But I trust that something amazing awaits. Maybe I need to step into the Jordan River and stand. I don’t know where that stand is but I trust that He will be with me. Thank you for this – God bless. dear Jamie, this is so special today and has uplifted my spirit! thank you so much for hearing from God and for communicating it and not keeping it for yourself..you are a sweet spirit. Today i had tears, so many and then i read how He knows every tear.. I pray for my spirit to be humble and so pleasing to Him, the One i most want to please. Instead of myself. Thank you Jamie! I do believe that this word is for me! I know and believe that the Lord has something very good and amazing in store for me and I thank Him in advance with all of my heart!!! Thank you for your faithfulness in delivering this message to us! Jamie, thank you for your obedience to be a vessel. The line about He is going to make me “better than I ever was before” is so special to me. I burst into tears when I read that because that is a promise God gave me a few years ago – those exact words. Still waiting on this promise and have been going through the hardest time of my life lately but clinging to Him and His promises. He is showing me he has always been my protector and is my healer. I came across your blog a few weeks ago and it has been a blessing to me. Sending you a big hug! Thank you Jammie for this post . I have been going through a very trying time in my family and health these past years . Each year I would think and say it was over but the devil would throw more darts . Praise God for the works of Jesus on the cross and his resurrection . I know I am more than a conquerer through Christ Jesus . Incidentally I have been praying over this scripture Romans 8:28 this year particularly . I know it is by the Spirit of God . Hi Jamie! Your words are so timely. Thank you for your faithfulness to God and love for His people. I had a breakdown a couple of months ago . I was determined not to go on anti depressants but gave in a couple of weeks ago . I’m feeling as if I’ve failed and should stop taking them as I don’t feel right . Thank you for your message . His Grace is all I need . There is nothing wrong with anti-depressants, my friend. Let God lead you. Thank you Jamie for the encouraging word and thank you Lord. I’ve had to remind myself in hard times that you give me grace for the moment and each time I do, you give me peace to tough it out along with grace. I’ve prayed through so much and even still I find myself not faithful in trusting you as much as I should and yet you still provide what I need even this very week. Your grace is enough. I love you. Oh Jamie, what a beautiful reminder that God is not afar off. That He hears the cries of His people and that he “honors” us. So true, right. We forget that part too often, and think we are unworthy ! I love the title too. Yesterday I was out raking and cleaning lawn and flower beds. In New England this is a tough job after the harsh winters we get. Branches blown down, debris everywhere. But as you pick up a messy pile of leave, you see the Iris’s have started to emerge. They were just waiting for you to come and uncover them. Spring is such a beautiful example of Fathers love and renewal ! Praise Him forever.